Transit Of Mercury Session @ Baltimore Woods – Monday, May 9th, 8 a.m. To 10 a.m. There will be no next-day reschedule of this event! Our hemisphere is being treated to the third Transit of Mercury this century, and Bob Piekiel is hosting an official observing session at Baltimore Woods to mark the event and to give keen viewers a sight of our (now) smallest planet. For those new to the phenomenon, a transit occurs when one small body passed in front of another larger body relative to the observer’s position. If you’ve ever been in the left lane of a three-lane highway, had a big truck in the right lane, and had a motorcycle pass in the middle lane at some blistering speed, you’ve witnessed a (kind of) transit. From our Earth-centric perspective (and sticking to one definition of a transit), transits occur when the inferior planets (which just means their between us and the Sun) Mercury or Venus pass between us and the Sun. Once we’re living on Mars, transits will occur when the inferior planets Mercury, Venus, or Earth pass between us (there) and the Sun. And you get the idea. Now a little math – Mercury revolves around the Sun once every 87.9 days – what we call its sidereal period. Because the Earth revolves as well, the time it takes for Mercury to hit the same basic spot between us and the Sun is 115.9 days (its synodic period). If all of the planets of the Solar System were in a perfect flat plane, that would mean we’d get a Mercury Transit every 116-ish days and the phenomenon would be a little less impressive. Because all of the planets are at slight tilts with respect to Earth’s orbit, we don’t always get clean passes – the Sun is huge overall, but still a small target at an Astronomical Unit, so the slight angles of Mercury and Venus matter when it comes to the proper lining-up needed for transits to occur. Click the map to make directions to Baltimore Woods. The next Mercury Transit (from an Earth viewing location, that is) won’t occur until 11 Nov 2019, then there’s a loooong wait until 13 Nov 2032. If you can get a free block in the morning, I highly encourage you to make the trip out to Baltimore Woods. The two Venus Transits I witnessed definitely “clicked” something in me about how the Solar System works (and the size of Venus against the Sun was a very impressive sight!). 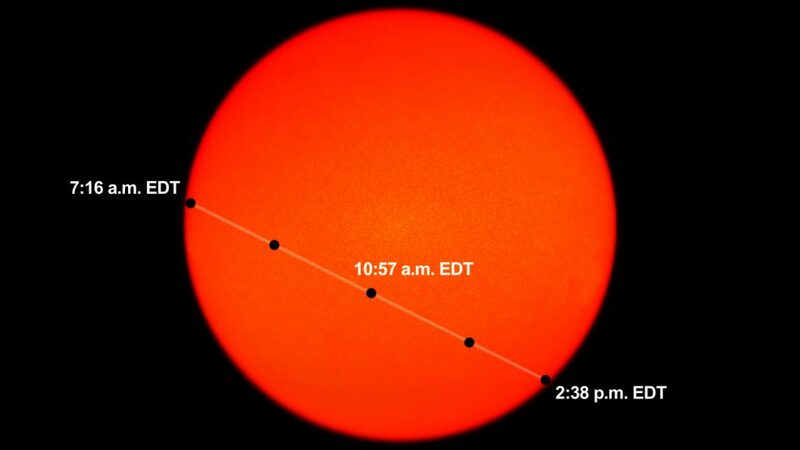 Rare Transit of Mercury Across the Sun. The planet Mercury will move directly between the Earth and the Sun. Viewers with telescopes and approved solar filters will be able to observe the dark disk of the planet Mercury moving across the face of the Sun. This is an extremely rare event that occurs only once every few years. There will be one other transit of Mercury in 2019 and then the next one will not take place until 2039. (Venus will also be visible right near the sun as well).